Enjoy Japan’s exotic range of colourful wildlife and botany as you journey through this blossom filled adventure. 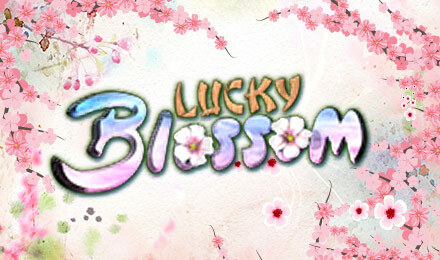 Lucky Blossom is a 5 reel online video slots game that enables you to watch the cherry blossom flow in the wind as you spin your way to great riches. Founded in 1997, Eyecon burst onto the scene with the wildly popular game, Gore. The millions of downloads provided their base to begin building an online casino system and gambling games. Their first ever slot, Temple of Isis, released in 2003, remains a firm favourite with online gamers today. Fluffy Favourites, released in 2006 is their most successful game to date and remains one of the best slot games available. You can discover more about Eyecon here. The global ambitions have recently taken a step further and Eyecon have translated many of their games into different languages for new geographical markets. A common denominator that connects Eyecon’s games is their visual appeal. In other words, they look lovely and when a theme is naturally appealing, their designs are eye candy! Lucky Blossom is an prime example and it oozes the ooooh, aahhhh factor. No matter your pocket size, you can enjoy this delightful slot and If you are a player that likes to take a risk with the high stakes, you can net some hefty payouts. The reels sit against an almost photographic image of the Golden Pavilion, a famous location in Kyoto, Japan. There are 25 bet lines to play, some nice features and a potential jackpot of 10,000, so if you fancy a trip to Japan via a slot sprinkled with a flavour of their elegance and culture, set those bets which range from 0.01 and go up to 250 and pack a bag. The five reels sit in a simple, bamboo framed panel. They spin against a vibrant blue background and the pretty symbols pop! These include the lower line line payer, playing card values, Jack to Ace. Next we have, an Old Geisha, a Geisha in Red, a Geisha in Purple, a Geisha in White, a Geisha in Blue, a Geisha in Grey and a Pagoda. The fan is the wild and subs for all other symbols except the scatter. Wins that are created with the help of the wild are doubled. The scatter is a beautiful Sakura Blossom. All the symbols are framed with an oval shape and this presents a very uniformed, clean reel set. The soundtrack is a jaunty tune and not overly oriental as you may expect. Still it compliments the game nicely. We have a Free Spins feature and this is launched when three, or more, Sakura Blossom scatters appear anywhere on the reels. Trigger this and you will be awarded fifteen free spins. During free spin play, any wins are tripled and, with a little luck, this feature can be re-triggered. At any time, should you choose to, you can gamble your winnings in a game of choice. Choosing correctly each time, boosts your total win. However choose wrong just once and it’s gone. Of course the big attraction of Lucky Blossom is the attractive 10,000 coin jackpot. The thrill is in the chase as they say. No flashy graphics or loud noises, but an elegant slot like this doesn’t need these and the gentle play is very smooth. 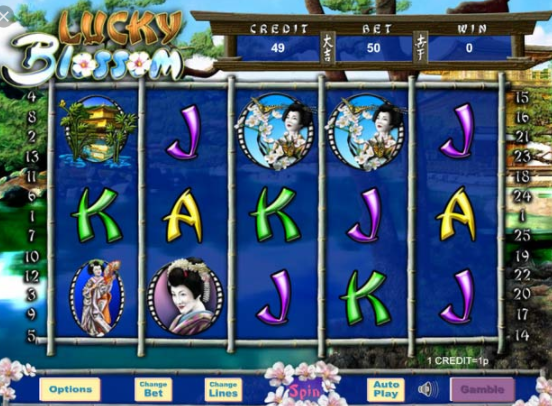 However, don’t be fooled by Lucky Blossom’s soft appearance, beneath is a feature packed slot that packs quite a punch. Beneath the reels a second, bamboo framed panel holds game buttons and setting options etc. Here you can tailor the game to suit, set your bets and line and set up auto spins. 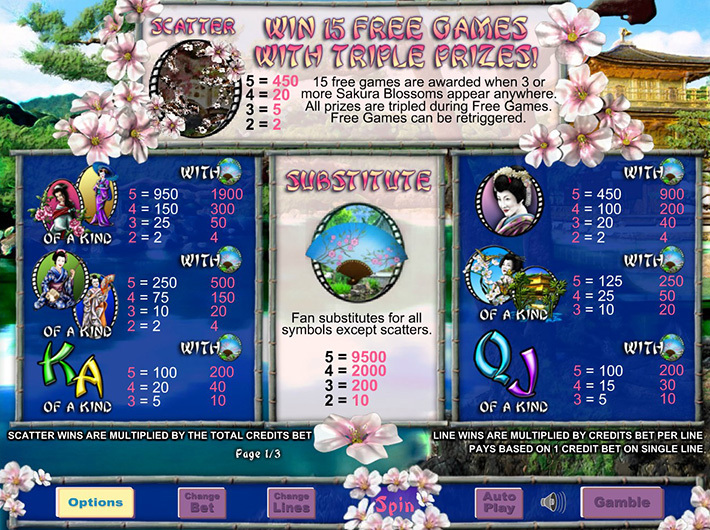 The spin button is framed with beautiful blossoms and next to that the gamble button. Lucky Blossom does a great job of capturing the beauty and appeal of Japan. Play a while and like many others you may find yourself booking further trips to the East. First impressions are excellent as Lucky Blossom, with a Japanese theme, is quite beautiful visually. The bet range will appeal to all pockets and the potential win of a 10,000 coin jackpot makes Lucky Blossom a firm favourite that should enjoy a lot of return play. Anyone interested in far east culture and a gentle, easy play with a good RTP ratio, will find Lucky Blossom extremely appealing.